Johann Wanhal, Viennese Symphonist: His Life and His Musical Environment. Paul Robey Bryan. Pendragon Press. 1997. ISBN 0945193637 (hardcover). The reputation of Johann Wanhal (Vanhal) as one of the most important eighteenth-century symphony composers has been acknowledged both by contemporaries of his time and ours. His music demonstrates the basic changes in the musical styles and compositional concepts that occurred during his lifetime; it reveals his extraordinarily fine talent and his role as an innovator, a contributor, and an influencer of others. The biographical section of this volume presents an analysis of the information sources and a new interpretation of Wanhal's life and his position in the musical community. The thematic catalogue of Wanhal's symphonies includes incipits of all the movements and all the copies, both manuscript and printed, that the author has found. Further significant additions to our knowledge of both Wanhal, his contemporaries, and their modi operandi are provided by studies of the manuscript copies themselves. They include a record of the groups of copyists, along with summaries and samples of the individual copyists' hands, and the papers they used. The descriptions of the manuscripts are complemented by a study of the publishers and their confusing opus-number systems as well as pertinent information about the individual symphonies. For those interested in Wanhal himself the lists of his autographs and analysis of his handwriting should also be useful. A Biography of Edgard Varèse. by Fernand Ouellette, Derek Coltman (translator). Da Capo Press. 1981. ISBN 0306761033 (paperback). Originally published by Orion Press 1966. A non-technical presentation of the life and music of this innovative composer. Good notes, works list and bibliography. The Works of Ralph Vaughan Williams. Michael Kennedy. Oxford University Press. 1994. ISBN 0198163304 (paperback). This is the authoritative account of Vaughan Williams's musical life – the story of a great composer's career, and at the same time the story of music in England for over half a century. Kennedy considers the principal works in chronological order, outlining the main features of each and discussing details of the music's structure, often illuminating his point with a musical quotation. He also provides a good deal of biographical data, and so builds up a picture of the composer, as well as providing thumbnail sketches of many of Vaughan Williams's friends and colleagues. Kennedy's extensive knowledge of Vaughan Williams's output also enables him to refer back and forth across the works to pick out lines of development and influence. 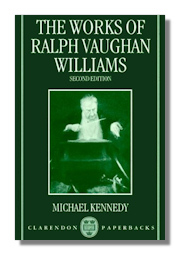 Along with Michael Kennedy's new preface, the second edition includes a full classified list of Vaughan Williams's works. R.V.W. : A Biography of Ralph Vaughan Williams. Ursula Vaughan Williams. Oxford University Press. 1992. ISBN 0192820826 (paperback). Composer Ralph Vaughan Williams, a man of strong character and unflagging energy, was for sixty years at the center of musical events in England. Utilizing source materials only recently available, this biography, written by Williams's widow, presents a detailed, fascinating account of his career. Vaughan Williams and the Vision of Albion. Wilfrid Mellers. Barrie & Jenkins Ltd. 1989. ISBN 0712621172 (hardcover). This, the second edition, was significantly revised and expanded. It incorporates a substantial amount of new material - notably three sections on the operas Hugh the Drover, Sir John in Love and The Poisoned Kiss. Also Wilfrid inserted into the final chapter A Double Man's Last Harvest, an account of the late A minor sonata for violin and piano. Read the Classical Net Review of this book. Vaughan Williams: A Life in Photographs. Jerrold Northrop Moore. Oxford University Press. 1992. ISBN 0198162960 (hardcover). Ralph Vaughan Williams was one of the most significant English composers of this century and a key architect of the English Musical Renaissance. Much from his prodigious output has entered the standard repertoire, and he is well-known for a number of major works, including the Tallis Fantasia, Serenade to Music, and the Fifth Symphony. Here is an entirely novel view of Vaughan Williams, his music and his life. Using techniques originated in his Elgar: A Life in Photographs, Jerrold Northrop Moore has drawn photographs from family albums (many hitherto unpublished), from the great photographic artists of the earlier twentieth century, and from newspaper and magazine files to build a fascinating illustrated portrait of the composer. The visual images are set with captions, many of them quotations from Ursula Vaughan Williams's unique biography, RVW. Verdi and His Operas. Stanley Sadie, with Roger Parker (Editors). St Martins Press. 1999. ISBN 0312244312 (hardcover). Extracted from the New Grove Dictionary of Opera, this volume contains a chronology of Verdi's works and significant events in his life, a 30-page biography, and nearly 200 pages devoted to the operas. A glossary and index of roles completes the book. The Life of Verdi. John Rosselli. Cambridge University Press. 2000. ISBN 0521660114 (hardcover), 052166957X (paperback). 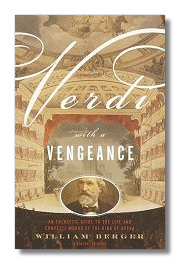 Verdi With a Vengeance: An Energetic Guide to the Life and Complete Works of the King of Opera. William Berger. Vintage Books. 2000. ISBN 037570518X (paperback). From the composer's intense hatred of priests to synopses of the operas and a detailed discography of the best recordings to buy, it can all be found in this volume. William Berger has given us a book as thorough as it is funny and as original as it is astute, an utterly indispensable guide for novice and expert alike. 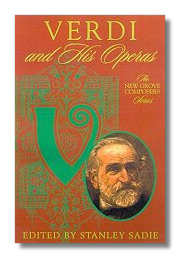 Verdi: A Biography. Mary Jane Phillips-Matz, Andrew Porter. Oxford University Press. 1996. ISBN 0198166001 (paperback). Tomás Luis de Victoria - A Guide to Research Robert L. Parker. Routledge (formerly Garland Press). 1998. ISBN 0815320965 (hardcover). Comprehensive listing of writings about Tomás Luis de Victoria and his music as well as information on recordings and modern editions of his works. Featured are a chronology of Victoria's life and publications, a publication history of the 181 authenticated works, and a listing of the 22 prints and 279 manuscripts from the late 16th century to the middle of the 19th century that contain Victoria's works whether they be lost, spurious, or dubious. Also included are comprehensive title and name/subject indices. The Villa-Lôbos Letters. 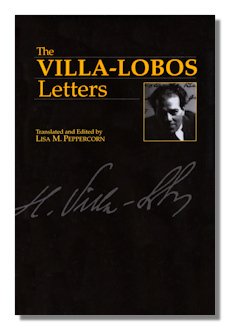 Lisa M. Peppercorn (Editor & translator), with a Reminiscence of Villa-Lôbos by Ralph Gustafson. Toccata Press. 1991. ISBN 0907689280 (hardcover), 0907689299 (paperback). This complete edition of the letters of the Brazilian composer Heitor Villa-Lôbos, collected for the first time in any language, details his stay in the Paris of the 1920s, his work in Brazil and the 1930s and "40s and his international travels as conductor of his own music. The letters also discuss commissions for ballets, concertos and other works. Lisa M. Peppercorn, who knew Villa-Lôbos, is the acknowledged expert on the life and music of this colourful figure, and she gives a detailed commentary on the events giving rise to the letters. A chronology gives a detailed account of Villa-Lôbos" life, which is thoroughly illustrated with photographs of the persons and places associated with Villa-Lôbos, facsimiles of works and concert programmes, and so on. Villa-Lôbos (Oxford Studies of Composers), Simon Wright. Oxford University Press. 1992. ISBN 0193154765 (hardcover), 0193154757 (paperback). 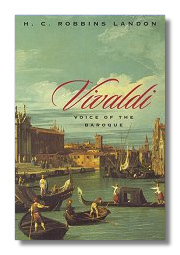 Vivaldi - Voice of the Baroque. H.C. Robbins Landon. University of Chicago Press. 1996. ISBN 0226468429 (paperback). Distinguished musicologist Robbins Landon "life and works" of the 18th-century Venetian master belongs on the shelf of every serious music enthusiast. Vivaldi. Michael Talbot. Oxford University Press. 2000. ISBN 0198164971 (paperback). 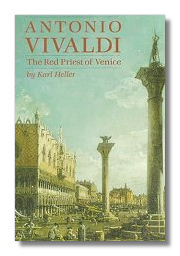 The author is one of the foremost Vivaldi authorities writing today. This is an updated version of the groundbreaking original 1978 work. Antonio Vivaldi - The Red Priest of Venice. Karl Heller, with David Marinelli (translator). Amadeus Press. 1997. ISBN 1574670158 (hardcover). Concerned primarily with Vivaldi as pioneer of the Italian concerto form in the political and cultural world in which Vivaldi struggled to make a living as well as the effect his music had on other composers of the baroque and classical periods. Antonio Vivaldi - Documents of His Life and Works. Walter Kölneder. C.F. Peters. 1983. ISBN 3795903386 (paperback).